“We have to hurry,” said Badir. “The man was asking people to write their names down. If too many people want the beaver gone…” Badir couldn’t finish his sentence. The class fell silent. “It’s very difficult to leave your home,” Badir said. And then he put his head down on his desk. While exploring the paths around Hinge Park with his mother, Badir could not believe what he saw—a giant rat swimming with a stick in its mouth! This animal was unlike any he’d ever seen before in his home country of Tunisia. When new Canadian Badir excitedly shares his discovery at school, he’s surprised by his peers’ reactions…nobody believed him! Determined to prove what he saw; he returns to the pond with his brother so that he could gain a witness. That’s when Badir learns that what he was seeing was actually a beaver. A lady who heard Badir call the beaver a rat corrected him and went on to show him a Canadian nickel while explaining a few interesting facts about the animal. Badir makes a personal connection with the beaver when he learns that it eats its meals after sunset, just like his family does during Ramadan. When Badir spots a man putting up a BEAVERS BEGONE sign, he knows he needs to do something to help the hardworking beaver. After all, Badir understands from experience how hard it is to be displaced. With the help of some friends, plans are made and actions are taken to protect both the animal and the surrounding park trees. In the end, they are successful, and Badir’s friends join his family for a Ramadan meal. 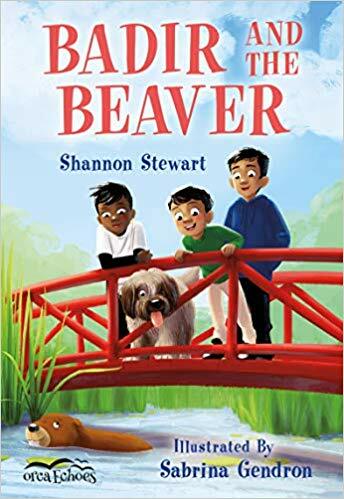 Badir and the Beaver was inspired by a real-life event that took place in Vancouver, British Columbia, where author Shannon Stewart resides. She teaches at a culturally diverse francophone school. This junior novel includes themes such as multiculturalism, biodiversity, immigration, environmental stewardship, and STEM education. In addition, the story empowers children to make a difference in their communities and promotes females in science. Stewart cleverly incorporates the teaching of basic Arabic language and traditions as well as information on Canada’s history and beavers throughout the story. She does so in a way that is comprehendible for the young audience for whom this book is intended. Badir and the Beaver is a good bridge for children who are transitioning from picture books to chapter books. The chapters are brief and include many full-page illustrations. Also, above the title of each chapter is a small illustration that provides a hint as to what will happen next in the story, thereby encouraging children to make predictions as they read. French-Canadian illustrator Sabrina Gendron’s animated characters are created in such a way that they seem realistic. Though her drawings in Badir and the Beaver are in black-and-white, the characters and images are lively and make the audience feel as though they are in the story. Overall, Badir and the Beaver is a versatile book that is enjoyable and can be used for multiple educational purposes. The themes within are current and relevant for many young children living in Canada. Andrea Boyd is an early years’ educator in Winnipeg, Manitoba. She is currently working towards her Master’s Degree from the University of Manitoba.